Here we have another well known double meaning black and white optical illusion. In the black part of this image you can see a musician playing what looks like a saxophone while facing right. On the white part it is showing the face of a young woman who appears to be looking straight back at you. Which do you think is the most prominent silhouette showing in this picture? 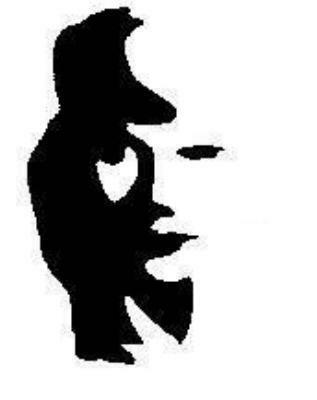 The black saxophone player or the white face of a young woman? I believe this image was created by Stanford U. psychologist Roger N. Shepard. It appears on page 76 of his 1990 book "Mind Sights" and is discussed in detail on pps. 139-142. His title is "Sara Nader."